Michelle Wolf doesnt think ABC was brave to revive the conservative-leaning Roseanne, nor does she think the Disney-owned network deserves credit for cancelling its biggest hit. On Sundays episode of her Netflix variety/sketch show The Break, Wolf weighed in on Roseanne Barrs bigoted tweet about former Obama advisor Valerie Jarrett, saying, Its not a joke. Its barely a tweet, and her excuse for tweeting it was [also] bad. Youve gotta get better at one of those, Roseanne, Wolf added. The comedienne then showed a picture from Barrs most controversial photoshoot: a 2009 spread for the satirical Jewish magazine Heeb, in which she dressed up as Adolf Hitler, and pulled gingerbread cookies out of an oven. Wolf then suggested a potential replacement for ABCs Tuesday night lineup: A new sitcom starring a troubled Lethal Weapon star  no, not that one!  with a long history of antisemitism. Wolfie’s 15 minutes are up. Give her a chance to go back to being a nothing again. And your parents should never have met. Wolf is not worthy of mention on FR. I have no idea who this stiff Wolfe is, but did the new Roseanne have a laugh track? I didn’t watch it. They’re a bigot if we say they’re a bigot. And that’s everyone we hate. Ya, there you go. Put shows on that Leftists approve of. Michelle Wolf is so popular and well-known that I’ve heard about her twice in my entire 59 year-old life. My, how the heathen do rage. Okay, we’ve heard from the Z List. Moving up a bit, what do Pee Wee Herman and Danny Bonaducci think? 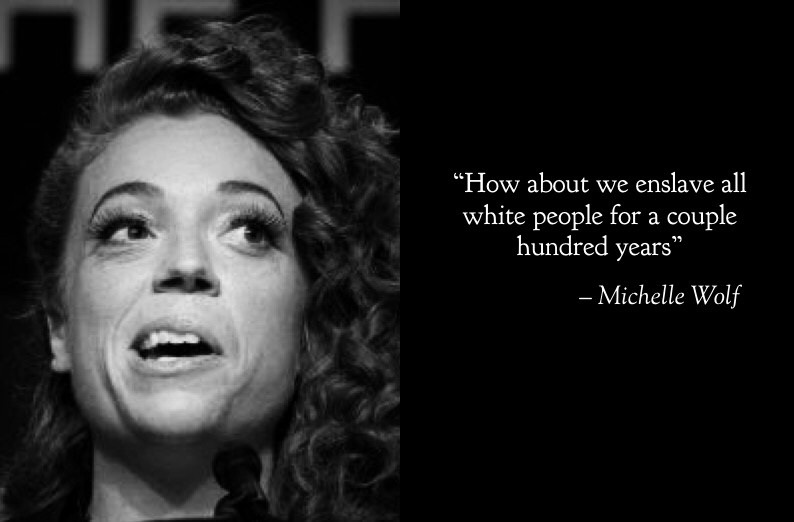 Who is Michelle Wolf, and why should anyone care what she has to say? Is this person the one who cried ‘wolf’ on the Corey Lewondowski fake arm grab? Seriously....I have no idea who this person is. Anther woman like Samantha C who is as funny as a bag of abortions! Well, at least some have the balls to say it. Michelle “Chocolate Eichman” Wolf hates Jews. Oh, the one from the White House Correspondents Dinner. I hadn’t heard of her before that and forgot about her since. I had to look her up again.